Imagine a military encounter where a U.S. naval vessel was blown to pieces off the coast of a hostile foreign nation and all hands on-board were killed. The next morning their bodies washed up on shore and their remains were dragged through the streets and ultimately fed to wild dogs. Whatever remained of their bodies was gathered up and dumped in a mass grave to be forgotten for the rest of time. Sounds like a terrible event that could have taken place in the past couple of years but subtract about 200 years or so and you'll be pretty close. The date was September 4, 1804, off the coast of Libya, in the harbor of Tripoli. The ship was the U.S.S. Intrepid, crewed by 13 navy sailors. The ship was packed with munitions and commanded by Master Commandant Richard Somers and his executive officer, Lt. Henry Wadsworth (uncle of the poet Henry Wadsworth Longfellow). While the origin of the explosion remains unknown, naval officials believe the crew anticipated that the Tripolines were about to take over the ship so the crew rigged the ship to explode. Preferring death to capture, the brave crew members ultimately blew up their own ship and sacrificed their lives. After the bodies were discovered and partially devoured by a pack of stray dogs, U.S. Naval prisoners in Libya requested and were granted the ability to bury Somers and his men in a mass grave in Tripoli. Somers and his crewmembers have remained in Tripoli ever since. In an effort to honor the members of the U.S.S. Intrepid, Somers' ancestors named a town after him: Somers Point, New Jersey. Additionally, six U.S. Navy ships have been named for Somers and a monument honoring him and his crew stands at the U.S. Naval Academy. Records from the Somers Point Historical Society and Museum seem to indicate that the Somers' family tried to reclaim his remains in the early 1800's, but the effort failed. Some 200 years later, a U.S. House bill was passed calling for the repatriation of the Intrepid's crew from Libya and efforts continue to be made to reunite these service members with their country and their families. The real energy behind this repatriation is the Somers Point Historical Society and the American Legion. In fact, plans have already been made for a monument and burial plot in Somers Point for Richard Somers' return. "Any service member killed in the line of duty deserves to come home," says Barry Searle, Director of the American Legion's National Security/Foreign Relations Division. "First, it is important for family members to have their loved ones properly buried in an environment that isn't hostile. But bringing Somers and his men back home is also a matter of national honor and trust." To watch a mini-documentary about the Intrepid, go to www. legion.org/legiontv. If you wish to support efforts to repatriate the remains of Somers and the Intrepid crew, go to www.the intrepid13.org. Finally, if you want to read more about Somers and the Intrepid's mission, go to www.intrepidproject.org. Leeanna M. Rossi, U.S. Navy veteran and member of the American Legion, Post 4, in Deming, NM. for sharing this photo and to Sally Hastings and the Somers Point Historical Society for taking the lead in designing and creating this magnificent, life-like bust. Hopefully it will be part of the monument that becomes his grave. SOMERS POINT, N.J. — Back in 2010 the Somers Point Historical Society (SPHS) began planning to erect a monument of the Barbary War hero who bears the name of the organization and its town. Richard Somers was born in 1778 and was the great-grandson of the town’s namesake. He achieved the rank of Master Commandant in the United States Navy and was killed in the First Barbary War with 11 other men when the ship he commanded, The Intrepid, exploded in Tripoli Harbor in September 1804. Since that date, six U.S. Navy ships have been named U.S.S. Somers in his honor. The SPHS held a series of fundraisers — and was able to rely on ongoing contributions from SPHS members, friends and local businesses — with the hope of having the monument in place honoring their local war hero by the fall of 2013. 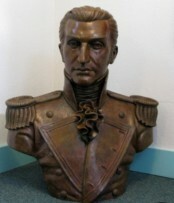 Recently that quest took a huge step forward when a 36-inch tall, 400-pound bronze bust of Cdr. Somers, arrived at the Somers Point Historical Museum. The bust is the work of Italian-born sculptor Luigi Badia of Somers, New York. When several Somers Point residents visited the New York town in 2011 to accept a “Key to the City” and form a sister-city relationship, they noticed a monument of Cdr. Richard Somers there, dedicated to the town namesake. Information was exchanged and — with the permission of the Somers, N.Y. town government and Badia — a new cast of Richard Somers was completed for the City of Somers Point. The bust will eventually rest on a five-foot tall granite pedestal, procurement of which is now underway. The entire monument will be placed next to the Atlantic County Library/Somers Point Branch on Shore Road — the site of the original Veteran’s Park — and in close proximity to the original birthplace of Richard Somers, his family burial plot at the New York Avenue School, and the ancestral home of the Somers family, Somers Mansion. Two local museums possessing artifacts and information about Cdr. Somers are also located nearby. The dedication of the newly completed monument is scheduled to take place on Saturday, Oct. 19, 2013. A few thousand dollars more is needed to complete the entire project. If you are interested in contributing, call (609) 927-2900, visit somerspointhistory.org or richardsomers.org. The monument will be near the Route 52 causeway that connects Somers Point and Ocean City. 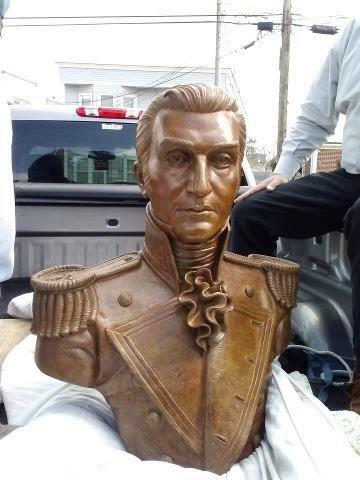 A 36-inch tall, 400-pound bronze bust of Barbary War hero, Richard Somers, recently arrived at the Somers Point Historical Museum. The bust is the first stage towards completion of a monument in honor of local naval hero Somers and the Intrepid crew, who died in 1804. The monument will be located near the Somers Mansion at the opposite end of the reconstructed Route 52 causeway from Ocean City, where a pedestrian and bicycle lane is near completion. The Somers Point Historical Society began planning for the monument in 2010. While ongoing contributions by Society members and local businesses have been collected, a few thousand dollars more is needed to complete the entire project. The bust will rest on a five foot tall granite pedestal, which is now underway, and will be placed next to the Atlantic County Library/Somers Point Branch on Shore Road. This is the site of the original Veteran’s Park and is also in close proximity to the original birthplace of Richard Somers, his family burial plot at New York Avenue School, and the ancestral home of the Somers Family, Somers Mansion. Two local museums which have artifacts and information about his life are also located nearby. The dedication of the newly completed monument will take place on Saturday, October 19, 2013. Plans for a mural project to be painted on the side of the library building are expected to be completed in 2014. The bust is the work of Italian born sculptor, Luigi Badia, from Somers, New York. While local residents visited Somers, New York, in 2011 to accept their Key to the City and form a sister-city relationship, they saw that they had their own monument to town namesake, Richard Somers. Contact information was given for sculptor, Badia, and with the permission of the town government of Somers and Mr. Badia, this new cast of Richard Somers was completed for the city of Somers Point. “It is extraordinary and exciting to share the same bust with our friends in Somers, New York,” said Somers Point Historical Society President Sally Hastings. “We are very honored to have this beautiful work of art available to honor Richard Somers. We look forward to the dedication when Luigi Badia will be with us as well as friends from Somers, New York, attending,” she added. Master Commandant Richard Somers was the commanding officer of a fire ship laden with explosives that entered the harbor of Tripoli, Libya, on September 4, 1804. The plan was to use the ship as a distraction for the Barbary pirates while the remainder of the U.S. Naval Fleet waited outside the harbor to enter once the ship exploded. Somers, along with Henry Wadsworth, uncle of famed poet Henry Wadsworth Longfellow, Joseph Israel and 10 other volunteers fitted the ship and sailed into the harbor. An explosion took place a bit sooner than expected, and the Fleet waited to catch sight of rowboats carrying the crew of the Intrepid to safety, but no boats appeared. There are a few scenarios of what happened. The Intrepid may have been spotted prematurely going to their destination; the boat may have exploded prematurely on its own; or, Somers and his officers seeing that the mission was going to fail and not wanting explosives in the hands of the pirates, exploded the ship themselves, killing the entire crew so as not to become prisoners of the brutal Barbary pirates. Initiatives are ongoing in an attempt to return the crew of the Intrepid to the United States from Libya. If the crew of the Intrepid should be returned to the United States, burial of all 13 crew members will be with the monument. To make a donation toward the Richard Somers Monument or the mural project, please send to Somers Point Historical Society, PO Box 517, Somers Point, NJ, 08244. For more information about the Somers Point Historical Society call 609-927-2900 or visit www.somerspointhistory.org. For more information about the City of Somers Point, NJ, visit www.somerspointgov.org or call 609-927-9088. WASHINGTON — President Barack Obama nominated a new ambassador to Libya on Wednesday, filling a post that has been vacant since Chris Stevens was killed in the Sept. 11 Benghazi attack and signaling the United States’ commitment to the North African country as it undergoes a perilous transition from decades of dictatorship. The announcement came as Secretary of State John Kerry was meeting Libyan Prime Minister Ali Zidan, and two days after the six-month anniversary of the storming of the U.S. diplomatic mission in the eastern Libyan city. No one has yet been captured for the attack, which has caused significant political headaches for Obama and his foreign policy team. Kerry thanked the Libyan government for its cooperation after the Benghazi attack and insisted that “those who killed Americans in Benghazi will be brought to justice.” He promised Zidan that America would continue working for a stable Libya. “We must not walk away from the difficult work that Chris Stevens and his cohorts were so dedicated to,” Kerry said. Stevens was the first ambassador killed in the line of duty since the U.S. ambassador to Afghanistan in 1979. To replace Stevens, the White House tapped Deborah K. Jones, a career diplomat who has served in Kuwait, United Arab Emirates and the now-shuttered U.S. Embassy in Syria. Jones, who currently works as a scholar at the Middle East Institute in Washington, also has spent time at embassies in Turkey and Ethiopia. Jones will assume a difficult position heading the embassy in Libya’s capital, Tripoli. The North African country has been beset by lawlessness, militant group rivalries and political instability since rebels, with the help of the U.S. and other governments, overthrew long-time dictator Moammar Gadhafi in 2011. Zidan also met with Obama and his national security adviser Tom Donilon at the White House. The president added his support Libya’s democratic efforts and outlined areas the U.S. could help the government strengthen its institutions and improve the rule of law, according to a statement by Caitlin Hayden, spokeswoman for the National Security Council. From Washington’s perspective, the most pressing problem is insecurity. Stevens and three other Americans were killed a half-year ago when a large group of men, possibly tied to Islamic extremist groups, assaulted the American outpost in Benghazi, and the help that arrived proved far too little and too late. The militant group Ansar Al-Shariah is suspected of carrying out the attack, which the administration initially attributed to a protest over an American-made, anti-Islam videothat spiraled out of control. Officials later retracted that account and called it a terror attack. But no one has been punished in Libya or elsewhere for involvement. However, the Libyan government heavily depends on security provided by commanders of several powerful militias that the president has labeled “legitimate” forces. Militias in Libya often act with impunity, running their own prison cells, making arrests and taking confessions in total absence of state control and oversight. The lawlessness also has allowed Gadhafi’s once-vast stock of weapons to fall into the hands of extremists who’ve sparked a civil war in neighboring Mali. A France-led intervention has pushed back the Islamist militants after they seized half the country last year. Speaking next to Kerry, Zidan thanked Obama and the U.S. for its key contribution in the effort to defeat Gadhafi. He said Libya would partner the U.S. in stabilizing his country and region. “This relationship will be at the best level,” Zidan, in his first to trip to Washington as prime minister, said through an interpreter. Associated Press National Security Writer Lara Jakes contributed to this report. ...Why?...Just to prove you can send a woman that Arabs hate to an Arab country that hates us?? President Obama will nominate Deborah K. Jones as the State Department’s new ambassador to Libya, the White House announced on Wednesday. If confirmed, Jones would replace Chris Stevens, the ambassador killed in the Sept. 11, 2012, attack on the U.S. Consulate in Benghazi, Libya. The deaths of Stevens and three other Americans ignited a political firestorm at the height of the 2012 presidential election and Jones’s nomination could provide GOP lawmakers theopportunity to again press the administration over the deadly attack. Jones served as U.S. Ambassador to Kuwait from 2008 to 2011, and has been with the State Department since 1982, holding posts in Abu Dhabi, United Arab Emirates, Turkey and Syria. White House spokesman Jay Carney praised Jones as a "career foreign service officer who has served admirably in diplomatic posts across the world." Despite her extensive Middle East experience, the Benghazi attack is likely to overshadow her nomination. Republicans have charged that the State Department, under the leadership of then-Secretary of State Hillary Clinton, ignored the existence of credible threats in the region. GOP lawmakers also criticized U.S. Ambassador to the United Nations Susan Rice after she initially blamed the attacks on a spontaneous protest of an offensive anti-Islam video. The administration later acknowledged the attack was terrorism and that no demonstration or protest had taken place in Benghazi. But officials defended Rice, saying that her statements had been based on then-current intelligence. Sen. Lindsey Graham (R-S.C.) said this week that he does not believe the White House has shared all its information in the incident. Graham said he intended to write to Secretary of State John Kerry and demand access to survivors from the attack. Graham and Sen. John McCain (R-Ariz.) had initially threatened to block John Brennan’s nomination for CIA director until the administration answered their questions, before relenting and voting for this confirmation. Both, though, have vowed to continue investigating the matter. Democratic lawmakers have charged Republicans with continuing to press the issue for political gain. Carney on Wednesday also said that Libyan Prime Minister Ali Zeidan was arriving for his first official visit to the U.S. Zeidan is meeting with Secretary of State John Kerry Wednesday afternoon, and will visit the White House later. Carney did not say whether Jones would be involved in any of those meetings.